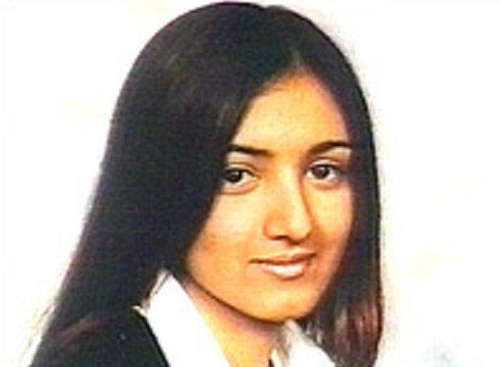 Delighted is the wrong word, but I’m very satisfied to hear about the conviction of 17 year-old Shafilea Ahmed’s parents, who murdered their daughter in Warrington, UK and dumped her body by the side of the River Kent. Shafilea’s crime? She refused to agree to an arranged marriage with her cousin in the Pakistani village of Uttam, Punjab. Shafilea’s parents have been given life sentences in jail, after a trial that saw many tense moments, including startling testimony by Shafilea’s younger sister Alesha, and Shafilea’s mother turning witness against her husband in an attempt to save her own backside from the full force of the law. Luckily this cowardly tactic failed, and the judge sent both parents to jail for murdering their daughter by suffocation with a plastic bag. They will serve a minimum of 25 years each, while their daughter will never get to see the ripe old age they’ll reach in jail. I’m impressed with the British Government’s hardline stance on forced marriages, and the work the UK High Commission has been doing in Pakistan over the years to help girls who have been forcibly brought to Pakistan to be married against their consent. This is a crime against both the girls’ human rights and Islamic law, as consent from the bride is a necessary condition to a legal Islamic marriage. Forced marriage is a cultural tradition in Pakistan that needs to be stopped, not indulged or encouraged by any misplaced sensitivity to multiculturalism. A harsh jail term for Shafilea’s parents serves as a warning to others who might want to follow their example and place “honor” and “shame” above the sanctity of human life. “Honor killing” is seen as something unique to Muslim countries and Muslim culture, where the definition of honor has a different meaning than it does in non-Muslim, Western cultures. In the UK, honor is a moral virtue, a slightly-old fashioned concept that reminds one of knights, duels, and valor in the battlefield. It has fallen into disuse as the more modern ideas of individual conscience, rule of law, and human rights have taken precedence. But in Pakistan, an agrarian society bound to feudal and tribal codes of kinship and morality, honor is all-important. Not only does it define conventional standards of conduct, acting as a safeguard to families’ and clans’ esteem in society, but it has been irrevocably tied to the sexual conduct of women, so that honor is synonymous with female chastity. Anything a woman does to threaten the family’s honor is therefore subject to harsh punishment—although in many cases a so-called honor killing is enacted for many reasons besides the obvious: Revenge in a family feud, for example, or to retain land or wealth. But Shafilea Ahmed’s case, and the way it’s being reported as an “honor killing” in the Western media, convinces me that we need to stop using the term. Instead we need to replace it with the word “murder”—because that’s what this is. We need to completely divorce the concept of honor from the act of murder. Terms like “honor killing” and “crime of passion” are euphemisms that attempt to attach a noble intention to the ultimate immoral act. They trivialize the murders of girls and women (and boys and men when they too are killed in the same circumstances), and refuse to acknowledge their rights, agency, and independence. Let’s throw the term “honor killing” in the garbage where it belongs. Along with it, the animals who murder their own children just because they were threatened—because of their own ego and evilness, or the fear of losing wealth and property, or a warped sense of shame—by their children’s right to marry, or not, as they choose. Here is a link to the UK High Commission’s Web site on Forced Marriage, with a number for you to call if you’re in any kind of danger. 6 Comments on "It’s Not Honor Killing, It’s Murder"